This post is a continuation of a previous one regarding building a conductive tattoo for my interface. In building a conductive temporary tattoo following the DuoSkin paper, I realize that there was a difference in thinking how the circuit needed to function for the soil sensor circuit. In order to read the resistance between the two fingers in the soil, parts of the traces need to be exposed in order to get the reading. However, the circuit that is created by the tattoo is insulated, covered by either adhesive or the silicon base of the temporary tattoo paper. As an experiment to try to create exposed circuits that would stick to the stick, I tried different types of base adhesive to see how the gold leaf could be applied to the surface. Tutorials from makeup blogs shows that eyelash glue for applying false eyelashes or petroleum jelly could be utilized to hold gold leaf to the skin. 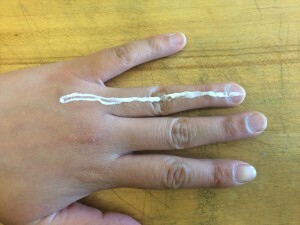 In this image, I have applied a thin layer of eyelash glue to my ring finger. The tube for the eyelash glue made it easy to squeeze a thin straight line onto my finger. 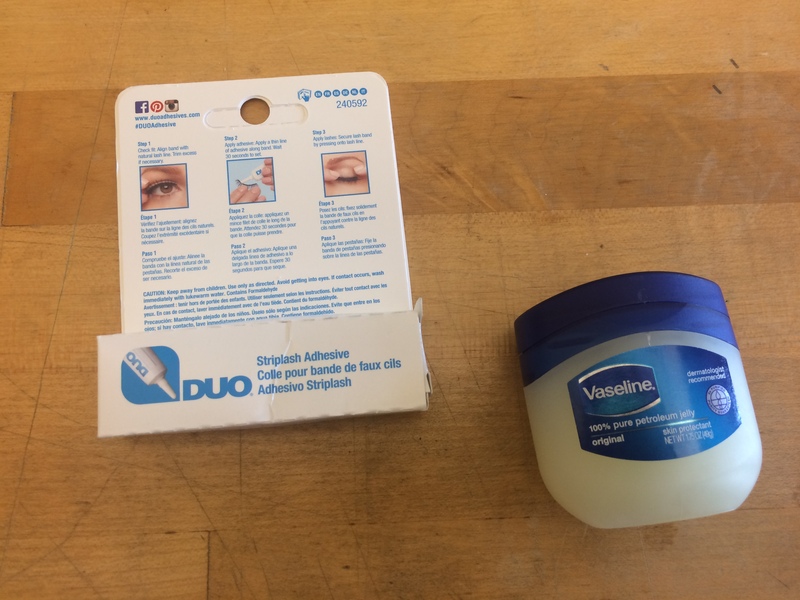 On the other hand, applying the petroleum jelly was trickier since it was hard to tell if I was applying a straight and uniform line to my finger. I used a cotton swab to put a thin coat on my pinky finger. This image shows a few experiments with creating different traces that can be worn on the body. The pinky uses petroleum jelly as an adhesive to hold the gold leaf onto the skin. 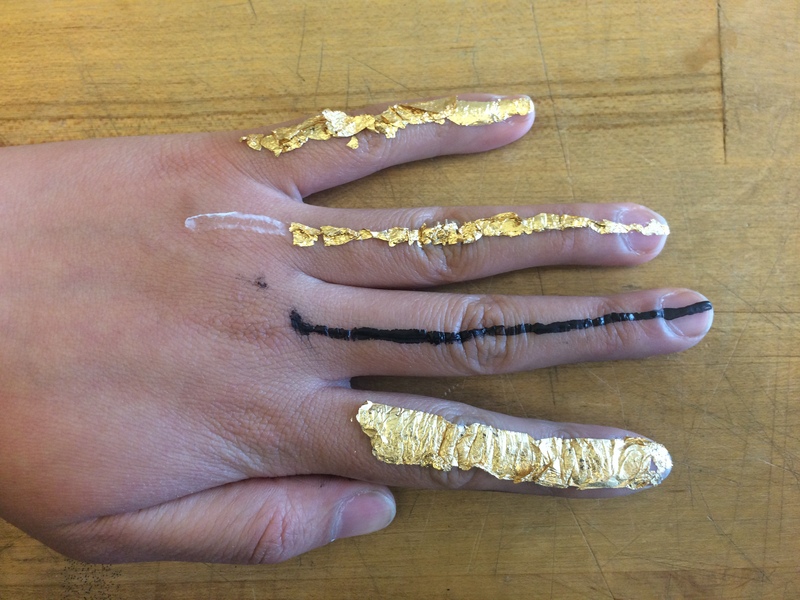 On the ring finger, eyelash glue is used to hold gold leaf onto the surface. 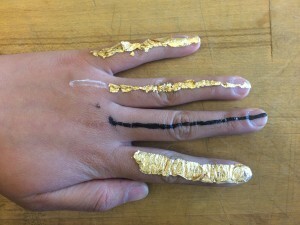 Then on the middle finger, I used some conductive paint by Bare Conductive, and finally on the index finger, I went for a combination of using petroleum jelly to hold gold leaf to my finger nail and then using the conductive tattoo as a trace connecting the nail to the finger. For a base adhesive, eyelash glue worked better than the petroleum. The petroleum jelly was effective in holding the gold leaf to the skin, however the greasiness of the jelly caused it slide around. The eyelash glue on the other hand dries very quickly so the gold leaf needs to be applied soon after putting down the glue in order to create a bond that can last. 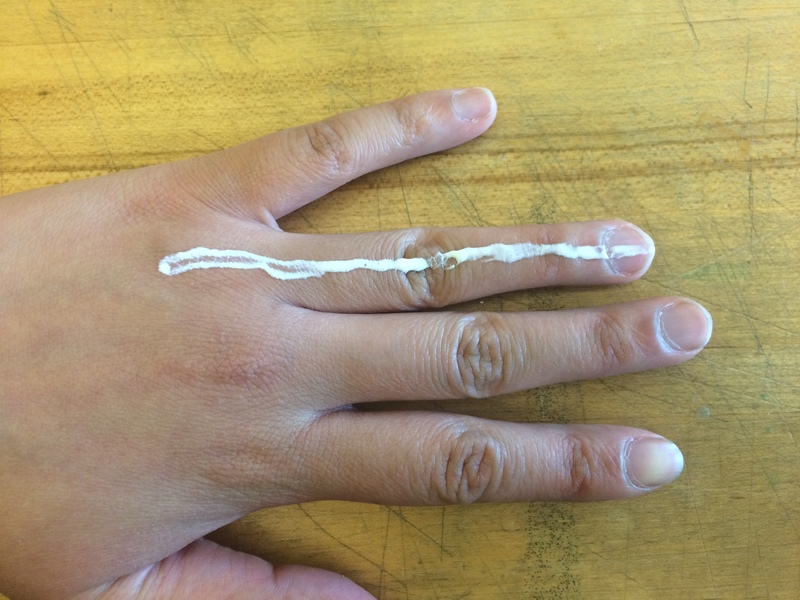 For the conductive paint, there was a high resistance across the short trace, a property of this conductive paint that can make it difficult to be used across a distance. With the temporary tattoo and petroleum piece, it was an interesting way to consider exposed and insulated parts of the trace, though it was hard to apply the two pieces in order to have the connect the two pieces. Overall, one issue with making the exposed trace was to keep the pieces from flaking or falling off through use. Placing traces on fingers also pose a particular challenge because the traces would then need to be flexible and robust enough to bend and move with the fingers. The benefit of the insulated trace allows it to be secured to the skin, making it more robust, especially along the fingers, however cracking did occur after awhile through normal bending of the finger. In referring to DuoSkin’s research and other work with conductive skin traces, most of the pieces were adhered to flatter places on the body away from joints such as the forearm, chest, upper arm or back. Applying the conductive traces to the fingers for this project is still a challenge in determining how to create a temporary circuit that can reside on these jointed sections and how to create both exposed and insulated traces. However, pursuing this research may allow us to understand how these circuits can be worn on different parts of the body, allowing for other types of interactions such as environmental sensing.